The Department of Civil Engineering pulls out all stops to create outstanding engineers - with advanced teaching techniques and learning aids for undergraduate students and state of the art research facilities for postgraduate students and doctoral candidates. Students are not only made experts in technical aspects but also in interpersonal skills, a vital ingredient to excel in the fast-paced world. The undergraduate program imparts students with mastery in the field of civil engineering besides fluency in mathematics, physics, instrumentation, computers, management and economics - essential requirements for any successful civil engineer. Students gain practical experience from field visits to industries, dams and irrigation structures, construction sites, etc. 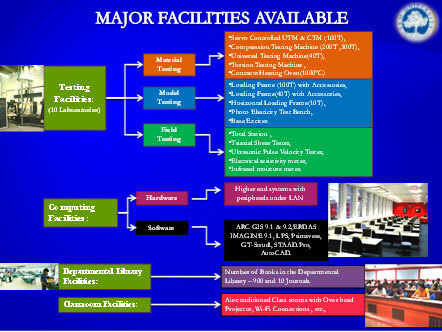 The department's ranges of postgraduate programs include core courses as well as elective, independent study. Students gain training in their field of study through summer internships. Doctoral research areas that are being pursued include concrete technology, structural systems, concrete bridges, soil-structure interaction, modern construction materials, irrigation water management and wetland management. Well qualified and experienced faculty members form the department. They specialize in structural, geotechnical, environmental, water resources, transportation, surveying, and construction engineering, as well as management, remote sensing and GIS. The faculty members contribute to academic development by publishing books and presenting papers in international and national conferences. The labs are well equipped with state of the art equipment. The research work at the school includes such domains as innovative interface material, traffic-resistant pavement material, and shear strength of high-strength concrete, recycled aggregates, bio-concrete and basalt fiber concrete. A national conference on ‘Recent Developments in Civil Engineering’ was held on campus in March 2012. Cordial ties with industry and government agencies result in consultancies, student projects and visits. Industrial contacts include National Highways, Livestock Research Center, Freyssinet, Stewols & Co., Hindustan Lever Limited, Simplex & Co., Saraswathi Precast Prefab, Madhucon Projects and Virgo Polymers. Experts from industry are regularly invited to present lectures and to interact with students and faculty. The department is a keen participant in various societies and institutes, such as the Construction Industry Development Council, the Institute for Steel Development and Growth and the Construction Management Society. An institute industry collaborative project in the use of 'Reborn Concrete' is on the anvil. M/s. Metecno (India) Ltd. has signed an MOU with SRM for collaborating on staff training and student training and research on development of new products. A student chapter has been formed for Indian Concrete Institute. Industry representatives visit the campus to recruit students finishing their degrees. The campus placement centre provides additional support for securing employment with companies such as L&T, Technip, Foster-Wheeler, Bechtel & Gammon, MAYHTAS, CCCL & Ltd, Shobha Constructions, Jain Housing Ltd. as well as several MNCs. Under the United Kingdom-India Education Research Initiative (UKIERI) program, one of the staff members of the school of Civil Engineering was invited to attend the International. Congress held in the University of Dundee, UK recently.